If you need a classic, smart colour for your next party, then navy blue is a great choice. Matching many different interiors, and providing a neutral base for the rest of your decorations, navy blue is a very versatile colour for both kids' and adults' parties. That's why we at The Party Warehouse stock a wide range of navy blue party supplies, making it easy to shop and decorate for your next big event. When you're throwing a party, choosing disposable party supplies makes it easy to cater for large numbers, and means clean up is so much faster. 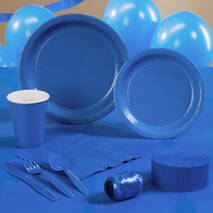 We offer a wide range of navy blue party supplies that are sturdy and attractive, so you can stick to your theme while keeping things practical. You'll find plain navy blue cups, three-ply napkins, and nine inch paper plates, all in a classic hue that'll look great in all sorts of venues. To decorate the tables, we also have plastic tablecovers which are waterproof, and can simply be scooped up and thrown away at the end of the night. Navy blue is suitable for all sorts of occasions, and is especially popular for adults' parties where they want a simple, classic look. It'll match the interior of most venues, or would be great for a garden party, and our disposable party supplies are safer than handing out glasses or china. You could simply choose an all-navy blue theme, or add some bright colours for an eye-catching look. Either way, our high-quality tableware will look great at your next party. Includes Pack of 20 - 2ply Napkins. Includes one tablecover - 54 x 108 inches.